MONMOUTH JUNCTION, N.J. – A pharmaceutical company is expanding their voluntary recall of certain types of infants’ ibuprofen. Tris Pharma, Inc. already announced the recall of some Equate branded ibuprofen sold at Walmart. 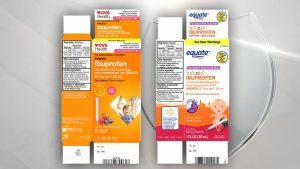 Now, certain infant ibuprofen products sold at CVS Pharmacy and Family Dollar are being recalled. The recall was announced because the affected products could have higher concentrations of ibuprofen than advertised. Infants who are at-risk may be more vulnerable to permanent kidney damage if they’re given the recalled ibuprofen. To view a list of affected items, visit the FDA’s website HERE. Anyone who has questions about the recall can contact Tris Customer Service by 732-940-0358 (Monday through Friday, 8:00 AM ET- 5:00 PM PT) or via email at [email protected].